Storage indicates amount of available/used space occupied by your video and image files. If you are concerned with storage capacities, we recommend you find out more about Hybrid Hosting. You can also purchase additional storage from this page, if you click on Buy Storage. To read more about Turbo bandwidth check our article "Using Turbo Bandwidth". 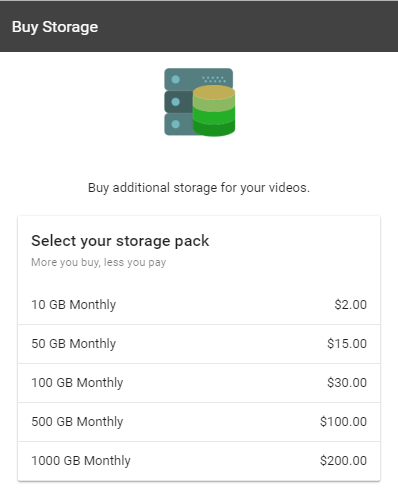 If you are interested to know how much storage space is consumed by your video, please refer to the article "How do you calculate storage? ".